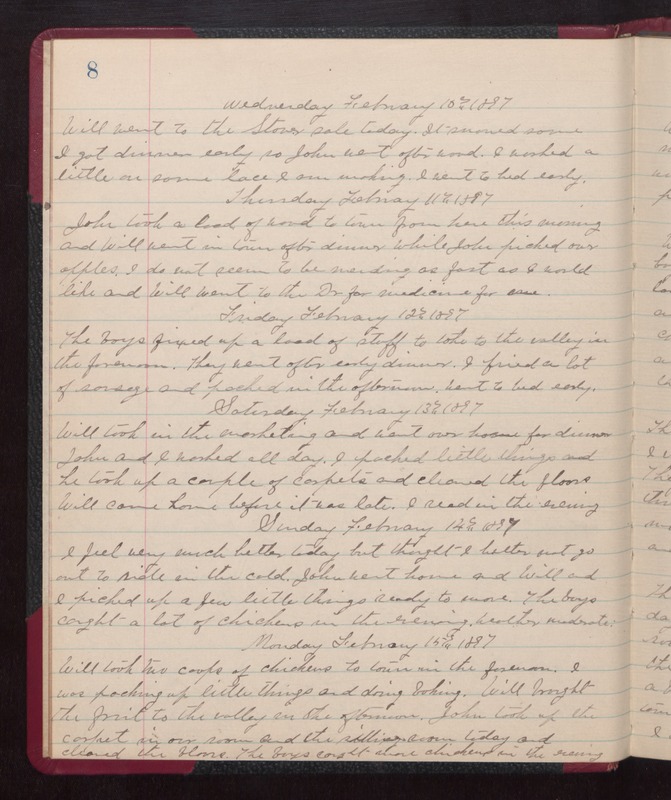 Wednesday February 10th 1897 Will went to [Stones?] sale today. It snowed some. I got dinner early so John went after wood. I worked a little on some lace I am making. I went to bed early. Thursday February 11th 1897 John took a load of wood to town from here this morning and Will went in town after dinner while John picked our apples. I do not seem to be mending as fast as I would like and Will went to the Dr for medicine for me. Friday February 12th 1897 The boys fixed up a load of stuff to take to the valley in the forenoon. They went after early dinner. I fried a lot of sausage and packed in the afternoon. Went to bed early. Saturday February 13th 1897 Will took in the marketing and went over home for dinner. John and I worked all day. I packed little things and he took up a couple of carpets and cleaned the floors. Will came home before it was late. I read in the evening. Sunday February 14th 1897 I feel very much better today and thought I better not go out to ride in the cold. John went home and Will and I packed up a few little things ready to move. The boys caught a lot of chickens in the evening. weather moderate. Monday February 15th 1897 Will took two coops of chickens to town in the forenoon. I was packing up little things and doing baking. Will brought the fruit to the valley in the afternoon. John took up the carpet in our room and the sitting room today and cleaned the floors. The boys caught more chickens in the evening.